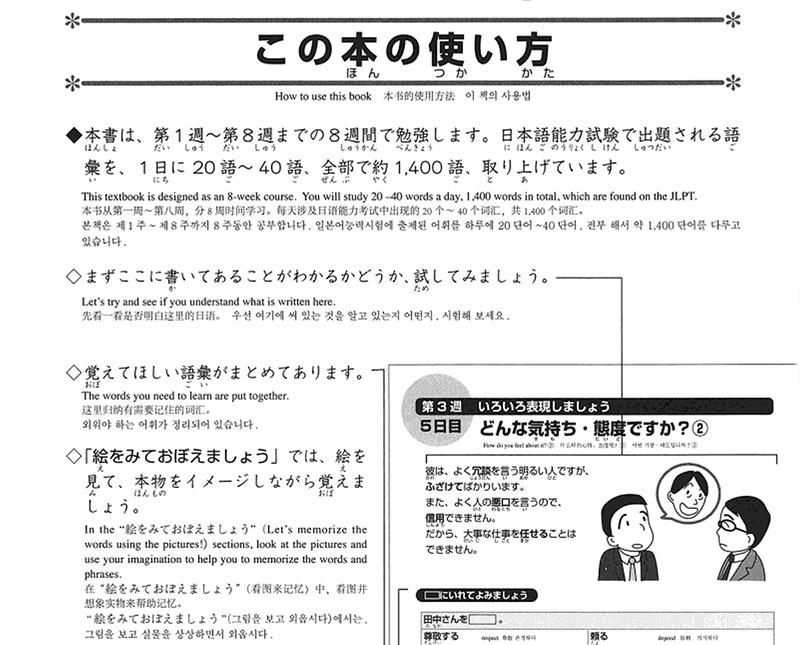 Preparing for the Japanese Language Proficiency Test, or JLPT, can feel like a daunting task. Studying Japanese and taking the test cold turkey would be foolhardy. Each of the five levels has its own set of grammar points, vocabulary, and kanji to master. There’s also a section to test listening skills. By preparing for a specific level, one can greatly increase the odds of passing. That’s why I picked up the Nihongo Sō-Matome series of study guides. Thanks to the series’ focus on specific JLPT levels, I don’t have to worry about what to study. Instead I can focus all my energy on the act of studying. Organization proves to be Nihongo Sō-Matome’s strong point. 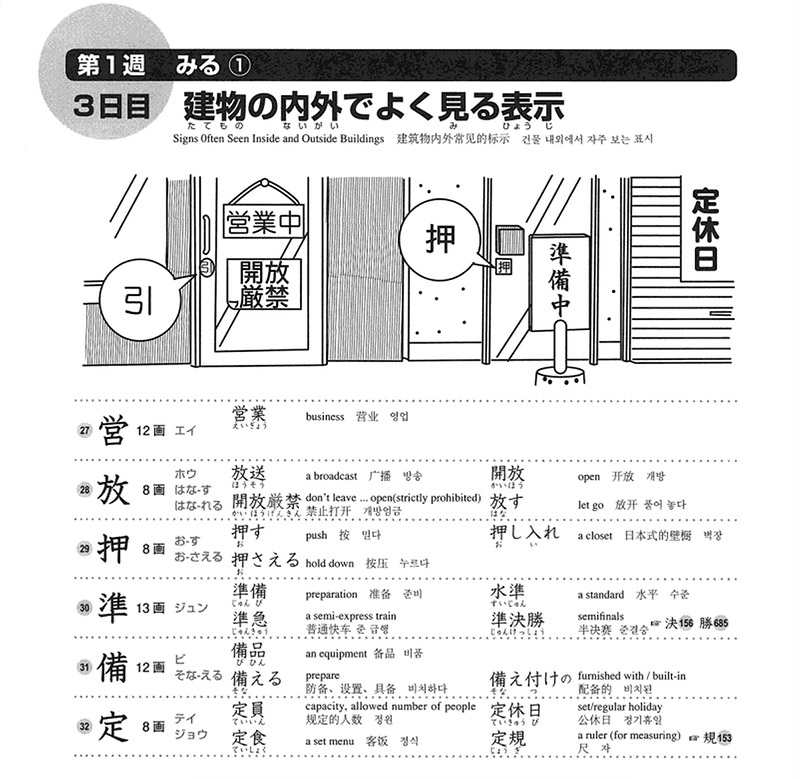 Each JLPT level has its own set of books that cover grammar points, vocabulary and kanji. Each lesson is meant to take one day and the books make up a six week program. Each week represents a major topic with various subtopics. For example, the week of “Let’s Enjoy the Day Off” covers topics like going out on a date, shopping and drinking. Each day presents a bunch of kanji, grammar points or vocabulary to memorize. 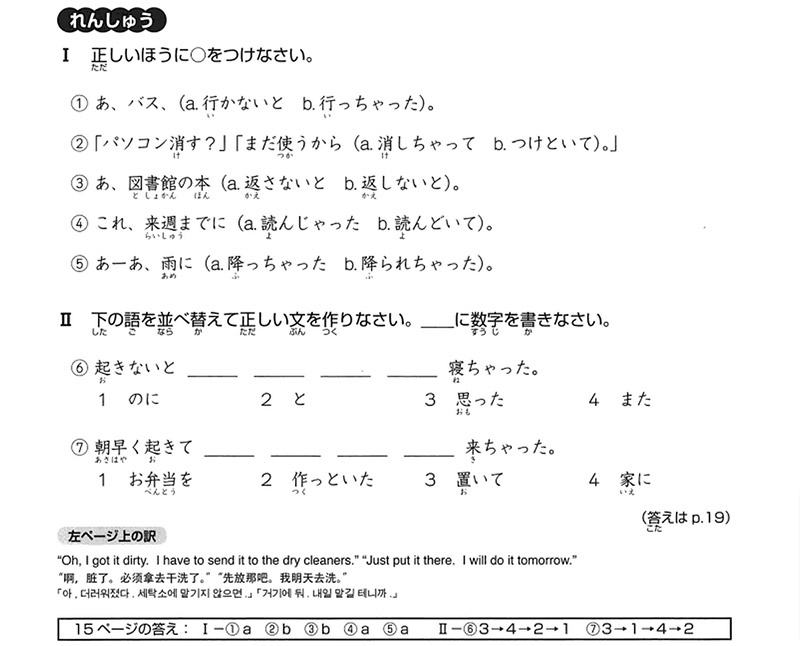 True to workbook form, each lesson ends with れんしゅう or practice with answers revealed at the bottom of the page. 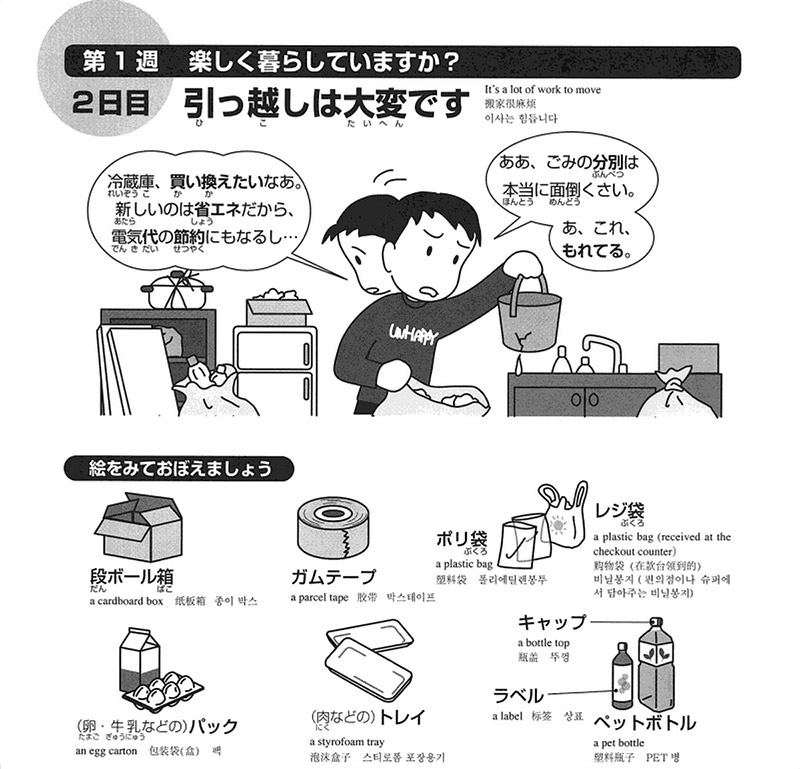 Each week is followed by じっせんもんだい or practice exercises that cover the week’s material. For those looking to cover ground fast, the daily lessons provide the perfect framework. Once again, you don’t have to plan, just study. For those looking for a more leisurely pace (like me) it’s easy to ignore this suggested time table and work at マイペース or your own speed. For black and white study guides, Nihongo Sō-Matome gives a friendly vibe. 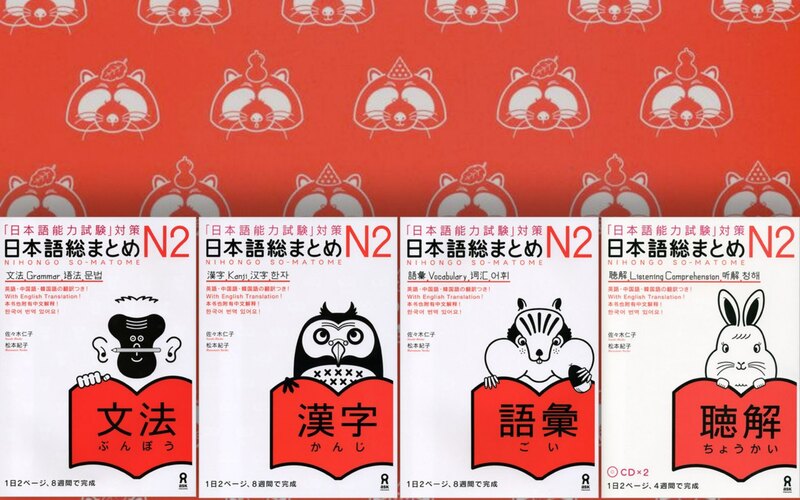 Each cover has a friendly little critter to welcome you aboard and help differentiate the topic – a vocabulary loving chipmunk, grammar efficient gorilla, big eared rabbit for listening, reading enthusiast tanuki, and owl kanji pro. Colors differentiate the book’s test level. Level N3 has a relaxing green that I really like, especially when compared to N2’s emergency red-orange. Each day’s lesson features cute little pictures to set the scene. The use of varying text sizes and highlights make each topic and subtopic easy to differentiate. From cover to cover Nihongo Sō-Matome offers a friendly and immediately recognizable visual style. Also worth a note: the series features Chinese, English and Korean translations. So everything looks great. The Nihongo Sō-Matome series is friendly, well organized (even in the face of three languages), and easy to follow. But is it easy to understand? In the case of vocabulary and kanji – yes. These straightforward sections offer simple chunks of data to memorize with little or no nuance. However the grammar books present a bit of trouble. Grammar points offer examples with translations and rules for situations depending on verb, adjective or noun use. But the series offers no explanation for grammar points with subtle differences in use and meaning. What offers a boon to language immersion purists presents the most frustrating point of Nihongo Sō-Matome for casual learners. In the long run examining the nuances between the meaning of similar grammar points may be the best way to master them. But for people studying for the JLPT on what the book proposes as a two month program, this can be frustrating. Instead of relying on one study source, outside research becomes necessary. Although “teaching to the test” has become a controversial subject in terms of high-stakes standardized testing, studying to the test still represents the best strategy for passing. Nihongo Sō-Matome offers well organized, friendly study guides for an intimidating test. Priced at about $10 to $20 each, the books are also very affordable. Thanks to Nihongo Sō-Matome, I’ll approach the JLPT’s vocabulary and kanji sections with extreme confidence. On the other hand, although it covers the basics of grammar, its lack of nuance and straight forward explanations has left me feeling unsure of myself. Nihongo Sō-Matome recently added the listening book to the series and I have yet to pick it up. But after viewing example pages it looks to offer the characteristic structured practice of the rest of the series. Small complaints aside, Nihongo Sō-Matome offers an efficient, confidence building way to study for the Japanese Language Proficiency Test. Sure, you might not be able to hold a conversation, but at least you’ll get that certificate. Besides, there’s plenty of time to speak after you master the grammar, vocabulary and listening points. These books are the most approachable that I’ve found for the JLPT (definitely more so than the Shin Kanzen Master series). My only issue is that so many things are left unexplained. If you’re going to use these books, I highly recommend you have a native Japanese teacher/tutor around to help answer your questions and clear up the vague answers provided by this series.